Okay, we’re going to get a little gross but it’s for a purpose. You’ve had a cold or a cough, and you hacked up what felt like a lung, and out of your mouth or nose, flew a glob of white mucus. 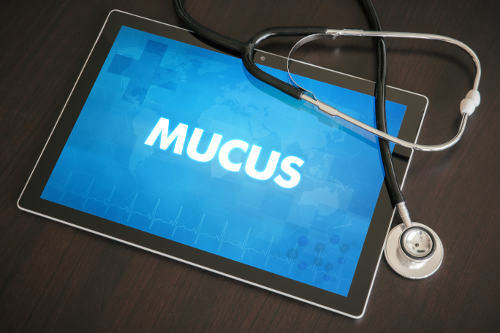 At times, you’ve probably even wondered why your mucus was white. Occasionally, it’s green or yellow or green and yellow, so why was it white this time? Well, that’s what we’re here for. We’re going to delve into white phlegm, and give you the answers to questions you were probably afraid to ask about out loud. We’ll discuss white mucus causes, and how you can get white mucus out of your system. This is your guide for all things white and phlegmy. So, you’ve been coughing up white mucus. Why is it white? What are white phlegm causes? For the most part, white phlegm is caused by what you think it is caused by. Yes, the most common of the causes of white mucus is the common cold. The 200+ viruses that can cause a cold, will cause the body to produce more mucus, which will usually start off as white. Don’t be surprised if the mucus goes from white to yellow, and then back again, as the mucus color can change during the progress of a cold. You may not recognize the term. but there is a chance that you’ve had them. Essentially, tonsil stones are a combination of bacteria, food particles, and waste that have accumulated in the folds of the tonsils. This gunk is then held together by mucus. During this period, you will more than the likely cough or spit out phlegmy chunks. If they do not get treated, it will lead to increased production of white mucus due to dryness in the throat and mouth. Allergies can cause excessive white mucus to appear, as your body is attempting to use it to get rid of the allergens that are giving you problems. Gastroesophageal reflux disease, or GERD, is when gastric acid ends up being pushed into your lower esophagus. Along with the heartburn that this causes, GERD can often lead to white mucus, as the body is trying to lubricate the throat. The body, not surprisingly, considers smoking a bad thing, and the smoke that you inhale is an irritant. In order to get rid of that irritant, the body can create white mucus in order to try and get rid of the smoke. If you are a singer or use your voice a lot, you may be familiar with this. Singing, talking, and yelling for extended periods of time can lead the body to create white mucus in order to lubricate the throat to prevent damage. Gustatory rhinitis is a really fancy term for the reaction your body has when eating spicy food. You know when you have a rather good but spicy curry, and your face turns into a fountain? That is gustatory rhinitis, and it’s caused by the body thinking it needs the mucus to repair the damage you are doing to it by eating the spicy food. Sinusitis, or a sinus infection as most of us know it, will create an abundance of mucus that will start and end as white. Bronchitis is an infection of the throat usually brought on by a virus. This type of infection inflames the throat, which means the body will produce more mucus to try and take care of the problem.The mucus will usually start off white, but will begin to take color as the infection progresses. In addition to the above-noted causes, white mucus can also be the by-product of head trauma, or a foreign body in the nasal cavity. Cold weather and over-excessive use of nasal sprays can also cause white mucus. Now that you know what can cause white mucus, its time to move on to how to treat it. You’ve been coughing up white phlegm, it’s pretty gross, and you would like to be done with it. So, what can you do to get rid of it? Luckily, there are some tips on how to get the white mucus out of your system. Drinking plenty of fluids is always recommended for a cold and other like-minded viruses. In this case, the fluids help thin the mucus, making it easier for the body to get rid of it. It’s kind of gross, but effective. Coughing the mucus out into a handkerchief or tissue will keep the bacteria contained in the phlegm, and prevent it from going into your stomach. Gargling with salt water can help thin the mucus and bring it to the top of your throat, and out of the body. Try a hot shower, a hot drink, or place your head over a boiling pot of water and inhale the steam. Steam helps thin mucus, making it easier to get rid of. Cough syrup is specifically designed to handle cough symptoms, including breaking up mucus to make it easier for the body to get rid of it. All of these are pretty simple to do. And besides obtaining the cough syrup, all of these tips can be easily done in the comfort of your own home. White mucus is in many ways, a good thing. It’s your body’s way of trying to defend your nose and throat area from things that it feels that it could hurt it, whether that be a viral infection, or a really good basket of hot wings. The next time you end coughing up white foamy mucus, don’t freak out. Just remember that your body is telling you something, and that if you want to clear out the mucus, there are plenty of ways to do it from the comfort of your own home.